Cancer Victory Gardens™: How to eat your herb garden! Months and months ago now I saw a newspaper article written about a Registered Dietitian sharing information about healthful culinary herbs along with easy recipes that included these tasty fresh herbs. 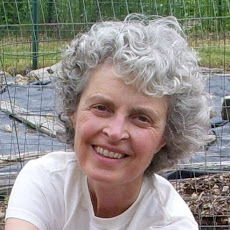 I wrote to ask if I could share her information on this blog because her tips fit so perfectly with the "cancer victory garden" developed by another Registered Dietitian for her cancer center in New Jersey that I have written about on this blog. Although winter is now setting in with earnest in many parts of this country, fresh herbs can still be grown inside in pots set in sunny windows. So yes, I am late posting this helpful info, but not too late! Many thanks to Denise Boozell RD, LD - Indianola Hy-Vee Dietitian, Indianola, Iowa. Add the more delicate fresh herbs – basil, chives, cilantro, dill leaves, parsley, marjoram and mint – a minute or two before the end of cooking or sprinkle them on the food before it is served. The less delicate fresh herbs, such as dill seeds, oregano, rosemary, tarragon and thyme, can be added about the last 20 minutes of cooking. May add fresh herbs to breads or batters at the beginning of the cooking process. Uncooked foods – add fresh herbs & spices several hours before serving to allow flavors to blend. A good rule of thumb when using fresh herbs in place of dried is to use two or four times more fresh herbs. For example, 1 tablespoon finely cut fresh herbs = ¼ to ½ teaspoon ground dried herbs. Herbs are a rich source of antioxidants, similar to fruits and vegetables, when compared on a weight-for-weight basis. Adding herbs when cooking is also a great way to add flavor, yet cut back on fat or sodium, making recipes healthier. Some herbs help reduce bacteria levels in foods, acting as a natural preservative. Basil: Most commonly used in Mediterranean and Asian cuisine. Add to salads, linguine and other pasta dishes. Take the leaves and crush them in your hand or snip with kitchen scissors to release their sweet aroma and taste. Basil grows easily in Midwest gardens, is rich in antioxidants and acts as an anti-inflammatory. Oregano: Known as the “pizza herb”, oregano, along with basil, gives food an Italian flavor. Oregano adds a wonderful flavor to pizza, pasta, egg and cheese dishes. Try sprinkling a dash of oregano on fried eggs instead of salt, or sauté fresh vegetables in olive oil with garlic and oregano. Has antioxidant and anti-microbial benefits. Chiles: Woodsy and warm flavors will penetrate even the most humble dish with a snip or two of chili peppers. Big chiles tend to be milder, while small chiles are the hottest. All chiles grow well in home garden plots. In the fall, hang the plants upside down to dry. Chili peppers contain capsaicin, responsible for the “heat,” which is a powerful antioxidant that may help lower bad cholesterol and rev up metabolism, and also help with stomach health. Parsley: Eating parsley will freshen your breath and perk up the flavor of many dishes. Sprinkle chopped parsley on spuds, toss into marinades and dressings and add as a seasoning to almost any type of pasta salad. Has concentrated chlorophyll levels, which is thought to help “filter” and maintain health of the stomach, small and large intestine. It is filled with nutrients such as vitamins A, C and K. Parsley grows well in gardens. Cilantro: Often used in Mexican, Asian and Middle Eastern cooking. It tastes like a sweet mix of parsley and citrus. Cilantro should be crushed or torn into tiny pieces before adding to recipes. It goes very well in salsa and bean dip. Is an antioxidant and aids digestion. Dill: Used in cuisine with seafood, dipping sauces, potato salads and dishes, vegetables and pasta dishes. Has anti-microbial and antioxidant health benefits. Taste, add more salt and black pepper if needed. Store in refrigerator up to 24 hours. Let set out of refrigerator for about 30 minutes before serving. This allows olive oil to come to room temperature. Serve with tortilla chips. Also great served with tacos, fish, chicken or pork. Note: truly best if you can obtain locally-grown tomatoes, cucumbers, corn and other vegetables. 1. In a food processor or blender, combine basil, pine nuts and garlic. With food processor running slowly add the oil, then the cheese. Season with salt and pepper. Tips – Add basil pesto to cooked pasta, a topping for baked potatoes, instead of tomato sauce on pizza, sandwich spread, even added to chopped hard-cooked eggs for a tasty egg salad. May use as a salad dressing by simply adding lemon juice to thin basil pesto. Freeze in small jars or line ice cube trays with plastic wrap and fill with pesto. When frozen, remove cubes of pesto from trays and freeze in plastic bags. Italian Bruschetta Developed by the Hy-Vee Test Kitchen. Toast bread slices in oven. On each slice, put a tomato slice and a cheese slice. Drizzle with a little olive oil and balsamic vinegar. Salt and pepper to taste and top with fresh basil. Snap off and discard woody bases of fresh asparagus. Rinse. Bias-slice asparagus into 1-1/2 inch pieces; set aside. Cook pasta according to package directions. Meanwhile, heat oil in a large skillet over medium heat. Add garlic and black pepper; cook and stir for 30 seconds. Add asparagus (wait a few minutes to add if using frozen), mushrooms, wine and ¼ teaspoon salt to the skillet. Bring to boiling; reduce heat. Cook, uncovered, for 4 minutes or until asparagus is crisp-tender, stirring occasionally. Remove from heat; stir in butter. Drain pasta; add pasta to vegetables in skillet. Toss gently to combine. Garnish with basil and crushed red pepper if desired. Tip: You can also use reduced sodium chicken or vegetable broth for the liquid instead of wine. In a medium bowl, combine mint, orange juice and honey. Blend until smooth. In a large bowl, combine watermelon, cantaloupe and honeydew. Pour orange juice mixture over fruit and gently toss. 1 cup Hy-Vee skim milk, heated to 115 degrees F.
Generously spray a baking sheet with nonstick cooking spray; set aside. In a food processor fitted with a metal blade, combine 3 cups flour and 1 teaspoon of the salt. Process until combined, about 5 seconds. In a 2-cup measure, stir together milk, yeast, sugar and dried rosemary. Whisk in 3 tablespoons olive oil. With food processor running, slowly pour milk mixture in a stream through feed tube. On a lightly floured surface, knead dough by hand until smooth and elastic. Spray a large bowl with nonstick cooking spray; place dough in bowl and turn to coat. Cover with a damp cloth and let rise in a warm place for 20 minutes. Heat oven to 400 degrees F. Punch down dough and stretch into a ¼-inch thick rectangle. Place on prepared baking sheet. Evenly prick surface with a fork and make small indentations with your fingers. Brush on remaining 1 tablespoon olive oil. Sprinkle the remaining ½ teaspoon kosher salt. Bake for 20 minutes or until light golden brown. Cool briefly on a wire rack. Serve warm. Nutrition Tip: Substitute whole grain flour for half of the bread flour for more fiber and a heartier flavor.